TheBerkshires24-7.com | We don't simply ADVERTISE your Business, we PROMOTE your Business! Why List your Business with TheBerkshires24-7.com? Because we don't simply ADVERTISE your Business, we PROMOTE your Business! (ranking higher by the day) for most common search terms . . .
✓ Try it for yourself! Click on any of the common search terms below; take notice of where our site ranks in Google Search results. Go ahead, visit other 'high ranking' sites and COMPARE their CONTENT to ours!! ▸▸▸ TheBerkshires24-7.com - Things to Consider: ✓ Our site is INTENTIONALLY SIMPLE ... not flashy or overwhelming, and very easy to navigate. Clear information is in plain view, as soon as you land on our site. Our ads are strategically and creatively placed (ie: our advertising WHEEL, Sticky Notes and Blackboards) to compliment the content, not bury it. Afterall, it is the content that attracts our viewers in the first place! ✓ Our site is CURRENT - we research constantly and update DAILY. No one cares about what happened last May. 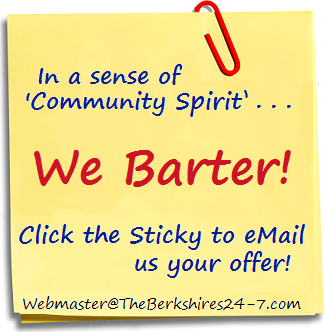 ✓ Our site is COMPREHENSIVE - we aim to cover all towns and all events - to serve the general Berkshire public & our guests. Whether you are an infant or an elder there's activity in this county for you! .. "it's goin' on, and we got it!" ✓ Our site is ORGANIZED - information and resources in one place... someone who is looking for nightlife can easily click links to find additional information about the entertainment, and the venue. Someone searching for a spot to swim will find ALL 75 Berkshire County lakes with maps/directions to them. Performing art venue listings offer the CURRENT COMPLETE season program schedule, and restaurant options to dine at are ONE CLICK away. ...you get the message here. ✓ Our site is the type people BOOKMARK; it serves as an ongoing reference to our county, in all seasons. 18% of our current visitors are returning viewers. ✓ Our site is currently 'shared' with others on facebook (the leading social network) an average of 35 TIMES per day! Impressed people, spreading the word. ✓ Our site is iPhone and Android friendly. No app required - get the Berkshires24-7 on the go! ✓ Our site offers you weekly statistics, keeping you informed of how many visitors clicked the links to your site (paid ads only). 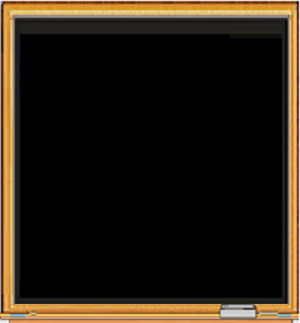 YOU decide if you are getting your advertising dollar's worth. ▸▸▸You will not find CHEAPER advertising rates anywhere else! This is My Business 123 Main St., Berkshire Town, MA 413/123-4567 - Here is where you mention all the wonderful reasons people need to visit YOUR establishment! Be as descriptive as possible! 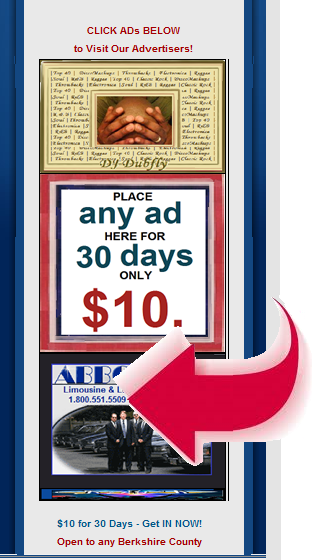 ◇ DISPLAY Ad: Use your own graphic or ad, or let us design one for you at no additional charge! Links to your website. 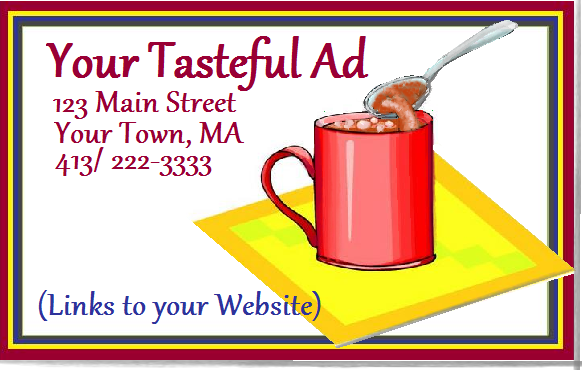 Rates are affordable and payable monthly* or yearly, something to fit every advertising budget! The safest & most secure method of online transactions! Weekly Specials on a BLACKBOARD! ONLY $20.- / 30 DAYS! (change your ad weekly - FREE!) CLICK HERE! CREATIVE Advertising for Restaurants, Bars or Pubs - even Retail Shops! CLICK HERE to advertise in THE WHEEL! $10 for 30 DAYS!! 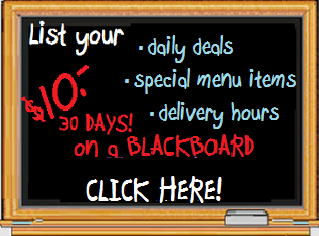 CLICK HERE to advertise on THE BLACKBOARD! $10 for 30 DAYS! !